As the salmon are running this fall I was able to find a little reminder of the big catch. This cluster of Silver Maple seeds look like a day’s worth of fish on a stringer. I didn’t notice the rainbow the other day but when I saw this pot of gold I knew that one must have ended here. The fall colors were brilliant in the warm sun yesterday and although we are “past peak” you can still find your pot of gold and capture the spirit of the season in an individual leaf or tree. You never know where your rainbow ended. Look closely! 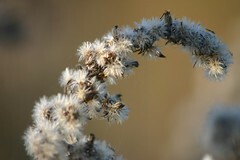 Are these fluffy seeds or clumps of frost foreshadowing our next season? Goldenrod paints out fields with brilliant yellow in the late summer as insects swarm to collect its pollen. 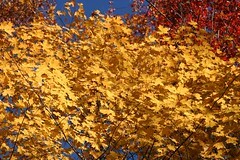 Now, in fall, it stands as a reminder of what was and as a symbol of what is to come. This weed icon persists through the harshest winter and the wettest spring to be reborn and paint another summer with sunshine. Can you find it every season? 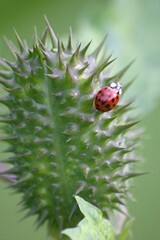 When looking at this image it strikes me how very similar the Angel Trumpet pod and the Ladybird Beetle are. Both showing outward signs of defense and danger while inside, on some level, they are edible to humans. Whether it is the sharp thorniness of the Angel Trumpet or the bright red and black aposematic coloration of the Ladybird I am in awe of the intricacy of natural designs. 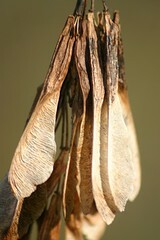 Each authentically solving an issue of survival with little consideration for the beauty that is often the byproduct. Last week I went out to pick a second bushel of “wild” apples. I walked around under the tree picking low hanging fruit and remarking that the old tree has outdone itself this year. My gaze rose as I contemplated where to climb up in the tree when my thoughts were abruptly stopped by this little face staring down at me. 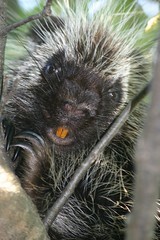 It appeared as though I woke porcupine from a morning nap as it blinked. Paying no attention to the sloth-like speed the the porcupine moved with when adjusting itself in the tree, I ran home as fast as I could to get the camera. Not surprisingly, it was exactly how I left it, half awake and grinning. After taking dozens of pictures, I returned to me original mission. I climbed up in the tree beside my companion, talking to him or her all the while. Nature is my steadfast companion. Could it be? I stopped and listened carefully and then… “Ur, Ur, Urdllll, drrr” Wow! This is a date to commemorate, our first singing rooster! The big question now it was it Elvis or Charlie? 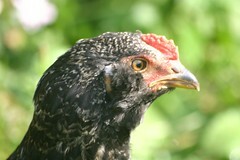 I carefully walked to the edge of the chicken pen and peered in but no sign of who the morning song came from. A mystery and miracle wrapped into one! 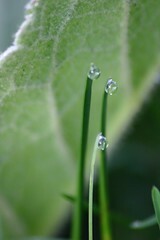 I discovered this little grass family the other day when taking a picture of a Great Mullen. They were hiding under one of the leaves in the basal rosette as if it was their umbrella. Mother, father, and child sheltered from the rising sun. You never know where you will find your miracle but it is helpful to leave no leaf unturned.